If you are looking for the modern RuneScape guide for this content, please see our The Eyes of Glouphrie guide. After you foiled a plan to destroy the Grand Tree things have been quiet in the gnome world. Brimstail has found a strange machine, built by Oaknock the Engineer, during the gnomes' Golden Age. What does the weird device do? Why on RuneScape was it built? Talk to Brimstail in his dungeon in the Gnome Stronghold. Gliders will put you on the top floor of the Grand Tree. Spirit Tree in the center of the Stronghold. Talk to Brimstail, who will start by talking about his new pet. Those cuddly creatures that wander in and around the Grand Tree. Curiosity will of course get the better of you and, as with all things that will get you into trouble, you are nosey thus ask him what he is doing there. Brimstail will explain to you he investigates Thaumaturgy, researches the Arcane and, as if nothing else matters, attempts to explain the inexplicable. You, of course, cannot help but blow your own trumpet, and thus a conversation about magic ensues. You will come to the obvious conclusion Gnomes aren't very well know for their magical abilities, and sure enough Brimstail will agree with you. You can do one of two things: Read all while doing the quest, or click through the conversation and read it below. Well, the most famous Gnomish Mage of all got into a bit of trouble. Most gnomes don't really talk about him, other than telling stories about him as if he was some sort of boogie-man. Ridiculous! He was a gnome like any other, he sounds like a fascinating character. He was one the King Healthorg the Great's advisors during the Grand Migration. But he was exiled after the Goblin Wars. Well I'm not really sure. This was all before I was born and no-one talks about what happened to Glouphrie these days. Did he do something wrong? Well, maybe. I'm not so sure. As it happens I've been looking into that part of our History. All I've managed to establish was that he was particularly interested in optics and light magic. I have also found out though he was generally disliked by other gnomes – his moniker was ‘Glouphrie the Untrusted'. Oaknock the Engineer and Glouphrie didn't like each other either. Oaknock was an engineer and architect. Very famous. There are statues to him around the place – his reputation amongst gnomes is second only to King Healthrog himself. He built most of the Stronghold you know. And here Brimstail's story ends….. for now. He now wonders whether you would like to see something and the sends you to the next cave to look around. Now walk back to Brimstail and tell him what you have found. He will of course see the Elven origin of the Singing Bowl and he does recognize the machine as being built by Oaknock. Brimstail is at a loss about everything else but he does know about a person that might know a bit more. A man you have visited before on a mission for King Narnode Shareen: Hazelmere. 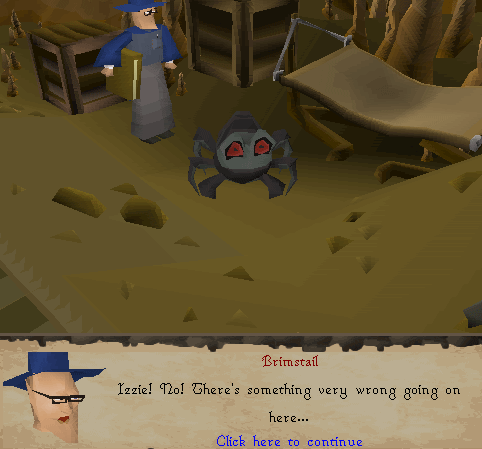 You obviously break out in a sweat, afraid to use the dictionary again to understand Hazelmere. Brimstail, however, seems to think he would love to talk about the Old Days and if he really wants to talk to you, he will surely find a way. One last request from Brimstail though: Find out anything you can about Glouphrie. And you are off on your merry way. Should you have your house in Yanille now is the time to go there: A short walk from where Hazelmere lives. 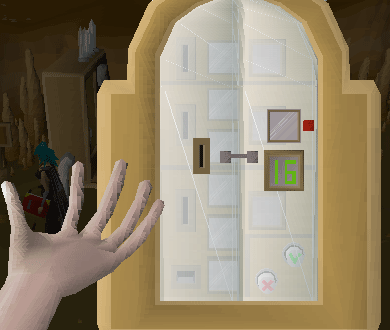 If not, either with a Watch Tower teleport or a Ardougne teleport you can get in the vicinity of Hazelmere's peninsula. 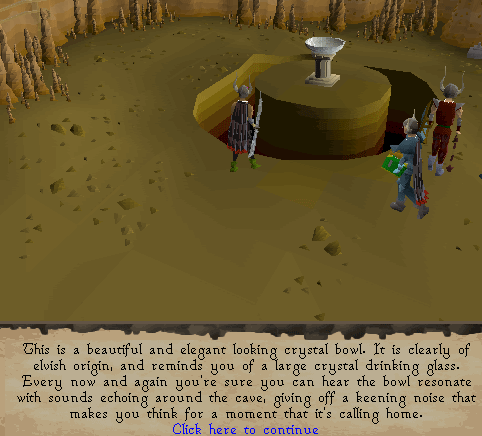 Or you could use the Fairy Rings with the combination CLS that will take you to Hazelmere's house, though you would need to travel to Zanaris to use this. Hazelmere can be found upstairs in the building on the peninsula. Totally amazed at speaking without speaking but by thinking, you start blabbering away until Hazelmere orders you to clear your mind, which is close to impossible for you. Thus having nightmares about winged lobsters, pink lobsters and such you reach the conclusion you can't do it. And Hazelmere tells you to shut up and listen. Let us travel back in time, to the time you humans call the Fourth Age. King Healthorg had become King. The elves mysteriously decided to travel west, leaving most of Kandarin open for conquest. The humans weren't here yet, only King Healthorg and the gnomes to the north, and a collection of Goblin tribes to the south. Both armies moved to claim the lands, and were of course destined to meet in battle. And so it came to pass the Goblin and Gnome armies met at the Battle of Atarisundri. Both side faced each other on the Battlefield. 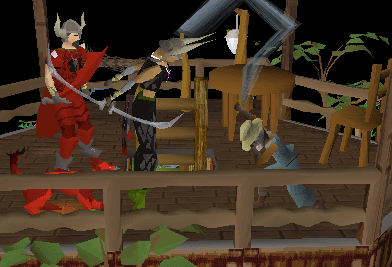 A bloody battle was in prospect, our gnomes were brave, but we were no match for the mass of brute goblin stupidity, but Glouphrie and King Healthorg had devised a plan: If you don't lead an invincible army – pretend you do. 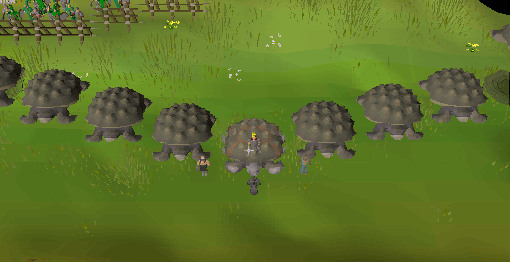 And so, Glouphrie created an army of illusory Giant tortoises, knowing that goblins would be scared of anything bigger than they were. Goblin: "Big Boss didn' say nuffin ‘bout de nomiez havin' monsta tortisses! Dey be huges! Tortisses too scary and pointy. We runz away! Hazelmere: Sadly, the golden times were not destined to last for long. 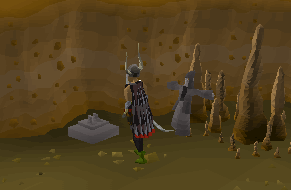 There was once a very special Spirit Tree in the Stronghold. Silver as a birch, old and wise – I considered him a friend. I called him Argento, his true name was unpronounceable. He was the first Spirit Tree I had befriended, and the one I knew the best. I would sometimes travel, visiting and finding other Spirit trees, and during one such trip I was filled with a great sense of foreboding. I felt a shadow pass over me, and a tingling in the air, even though the weather was fine and dry. Then I felt a sudden pain, as if the Anima Mundi was crying out with the loss of a favored child. And I knew that one of the Old Ones had died, and I had lost a friend. Someone had been hiding his death. I talked to Oaknock and he was incensed. He immediately blamed Glouphrie, and although Oaknock could be rather irrational when it came to Glouphrie, they never saw eye to eye, I knew he was right this time. Glouphrie had used his magicks to hide the truth from all of us. Oaknock had made a machine – an anti-illusion machine, with some help from the elves. He prepared it, and summoned the advisors to Argento. King Healthorg: "Why have you summoned us here?" Oaknock: "You'll see sire. Switch the machine on!" King Healthorg: "What is the meaning of this?" Oaknock: "The Silver Spirit Tree is dead! Glouphrie has been using his foul arts to mask the truth! What other secrets has he been keeping?" Glouphrie: "I live to serve you sire. I work for the good of us all"
King Healthorg: "How can lying to your fellow gnomes be ‘Good'? Glouphrie: "Some things are best kept secret." King Healthorg: "Enough! How can I trust a gnome who hides things from me?" Glouphrie: "No gnome can blame you for what you do not know." King Healthorg: "Glouphrie, you are no longer my advisor. Leave this place. Glouphrie: "Only the naïve believe they can rule without someone like me. Your empire will crack and gnomes will become but a joke. Hazelmere: And so Glouphrie left and traveled with some companions to a place they called Arposandra. We have heard nothing but rumours about them since. Nobody knows for certain where it is, somewhere rocky I suppose. The rumour is that after founding his new home, Glouphrie used his magicks to shroud the city in mist. Arposandra may not exist at all, however I suspect that Glouphrie is still around, one way or another. Just call it Gnomish intuition. You now can head back to Brimstail. Be sure to stop off at a bank along the way, because there are a few items you will need for the next part: An Oak log and a Maple log, a Saw, Hammer, Bucket, Knife, Pestle and Mortar and a Mud Rune. And, with the logic of Sherlock Holmes, a culprit is found: An invisible one. Strong reasoning brings the both of you to an inevitable conclusion: The anti-illusion machine was sabotaged to keep something from being discovered. Thus the machine needs to be repaired. Go to the next room and inspect the machine, try to repair it and you will see what you need: 2 types of logs and a resin based glue that smells of pine, and contains flecks of gray powder that glint and sparkle. 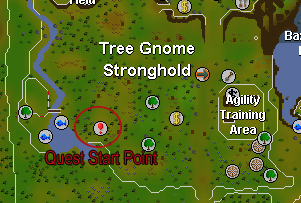 The easiest way to get sap from an evergreen (actually, just about any "pointy" tree will work fine) is north of Falador. Plenty of them around and a quick Falador teleport will put you very close to them, a glory teleport to Al Kharid, and the glider back is pretty fast traveling. Use your knife on one of them with an empty bucket in your inventory and it will automatically fill with sap. 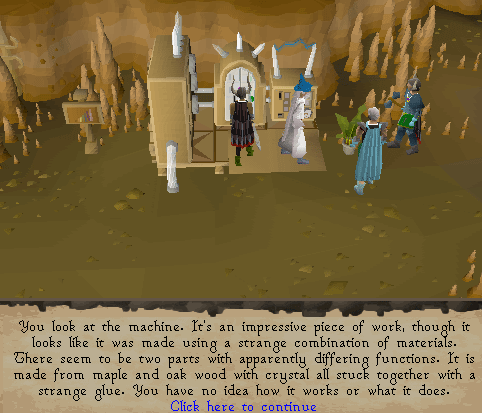 Grind down a Mud rune with your Pestle and Mortar and your will end up with Magic glue. Now head back to Brimstail's Dungeon and you can start repairing the machine. Once fixed there still is one problem remaining: The machine is locked and you need to figure out a way to get to the control panel that will make it work. To unlock the machine you need to look at the sign on the left hand side next to the machine. On it you will find a shape in different colors. Red is 1, Yellow 3 and so on till the end of the stacks. To open the front panel you need to equal a number (random for each player), for this you can only use one specific crystal. Brimstail will happily give you a certain amount of crystals. Should you need more you can try and ask for more but once you have enough to work the machine or enough to get other shapes through the Crystal changer he will not give more of them. On the right hand side of the center panel is a "Crystal changer" you can add up to 3 different crystals in the machine. On the exchanging machine to make them change you must click on the 2-way arrows between the two vertical squares. If the counter value is too high, the machine will reject them, and put them back in your inventory. If the value of counters is valid then a combination of other counters equal to the value that you have put in will appear in the 2x2 grid. 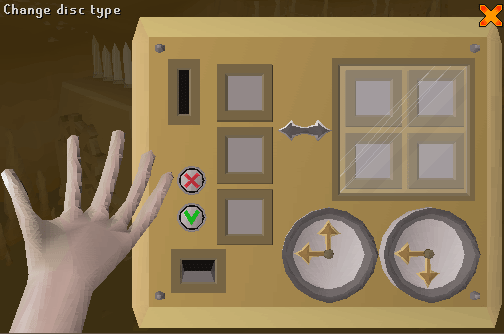 You can keep on clicking the 2-way arrow until the counter selection that appears is what you want. To confirm a transaction, click on the green 'V'. To cancel a transaction, click on the red 'X'. The operating panel is the same thing again but with a twist. Now you need to complete three different puzzles. 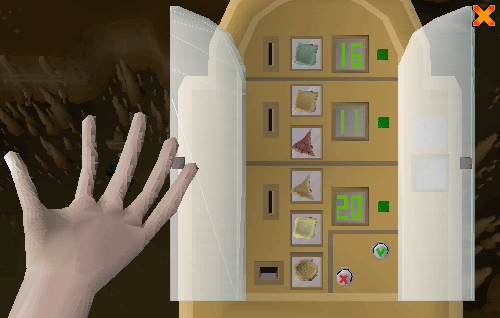 With the other machine when you enter a counter it will appear in the top empty box within the range that has been selected. If the value is too small, an arrow will appear to the right of the counter pointing upwards. If the value is too high, a similar arrow will appear, but pointing down this time. If the value is correct, the square to the right of the corner will turn green. The numbers in question like the one on the front panel are random and different for each player. And sure enough after some more Holmes like deduction it is decided these creatures formerly known as cuddly are nothing less than spies in the service of the Arposandrans. Brimstail suggests you go to King Narnode Sheen to relate the story to him. Well, you need to go there but first take a short detour: It will save some time. What you need to do now is to kill six wandering spies. The first one is at your feet, or at least at Brimstail's, use whatever means necessary to rid yourself of this enormously dangerous adversary and kick the living daylights out of it. You could bury the only thing this creature drops: bones. It shouldn't be much of a problem with the one hit point they have. Exit the cave and look for victim number two at the front gate of the Stronghold. You could have a waiting period, as with all the others you need to kill. If a fellow player killed this evil beast just as you walk up, you need to wait about 15-20 seconds before the next one appears. Now take a leisurely walk up to the Spirit Tree to rid yourself of number three. One more outside and that one is north of the Swamp in the Tortoise Training Area. 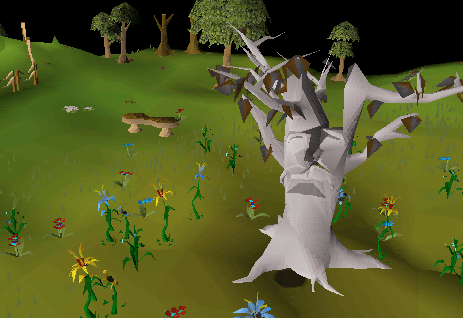 Now you can go into the Grand Tree and talk to King Narnode Sheen. He then orders you to seek out and destroy the rest of the little critters. Well, since you already did finish off four of them you need only find two more. One is at King Narnode Sheens feet. Kick it, hit it, put an arrow in it, it doesn't matter what as long as it doesn't see another sun-set it is ok. Only one more to go, and this one means climbing some ladders. Up to the glider platform and dispatch the last one to kingdom come. You will have finished this history-ridden quest. Once King Narnode Sheen has handed you the Small Crystal Seed head back to Brimstail and enter the cave. Now go to the middle of the next room and cross the Crystal Bridge to the Singing Bowl. Use the first option and you will see yourself charging the seed and thus turning it into a Crystal Saw. 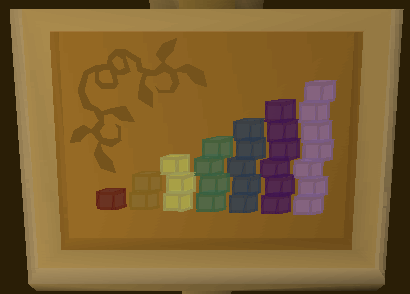 The Crystal Saw adds +3 to your construction level thus making it possible to make items well above your present level. It even works in combination with other construction enhancing materials like tea and stew. If you happen to lose your crystal saw or small crystal seed, you can get another small crystal seed by talking to Brimstail. Select the option: "Hello, just wanted a chat" and he will give one to you.